In our travels through India and Nepal, we have had occasion to stay in a variety of accommodations – from the over the top luxury of The Leela Palace to the rural village tea houses of Nepal. 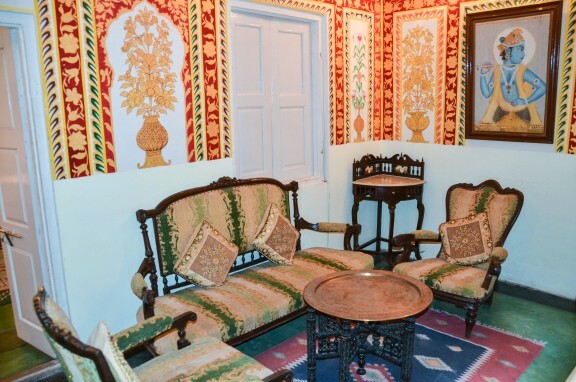 But the prize for most eccentric lodging goes to a haveli of Rajasthan. A haveli is a private mansion in India or Pakistan, distinguished by features of Islamic Architecture such as enclosed courtyards and vivid frescoes. 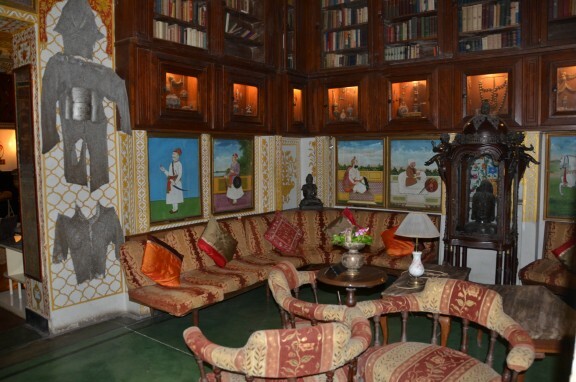 In recent years, many havelis have been converted into heritage hotels, inviting visitors to experience the opulence of a bygone era. 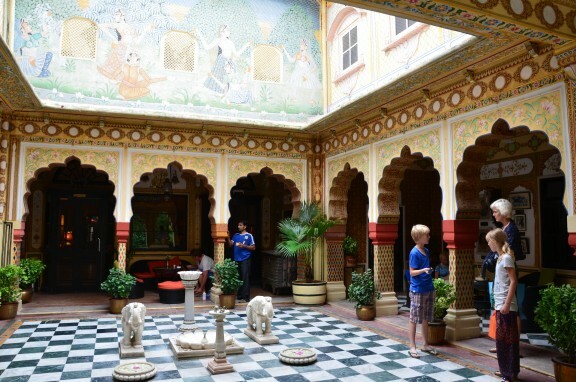 The Jagat Niwas Palace in Udaipur is typical of this architecture, with a central courtyard garden and delicate fresco paintings decorating many walls. 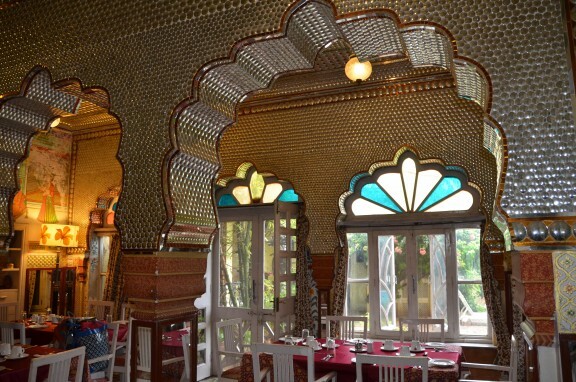 Even more fantastical, are the jharokhas – enclosed balconies – looking out on Lake Pichola. 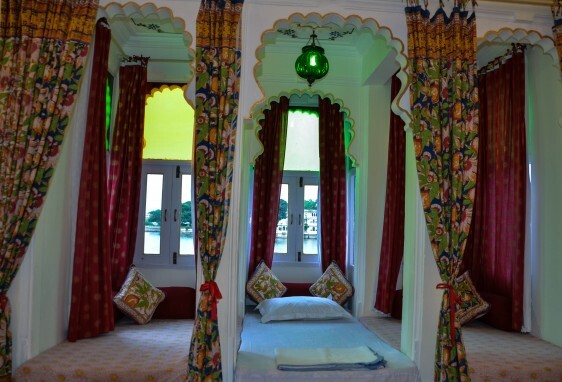 Staying in the Pichola Suite, we had a jharokha in our room which doubled as a sumptuous daybed and window seat. 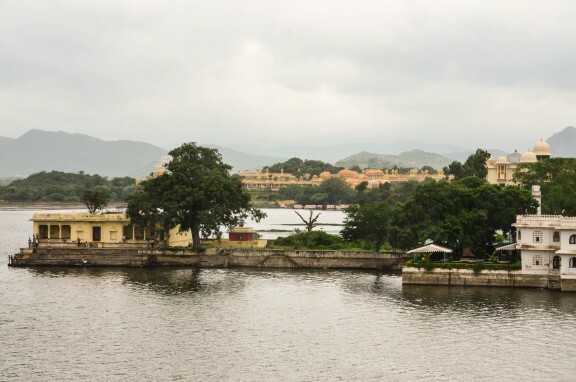 Our favorite jharokha, however, was in the rooftop restaurant, where we could look out on the lake while dining in splendor. And, my, the view of Lake Pichola was certainly splendid. Beautiful, but not eccentric. 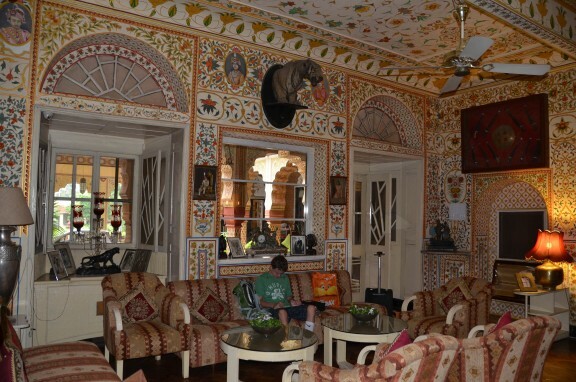 The Hotel Bissau Palace in Jaipur, on the other hand, was that and more. Our room – comprised of a main bedroom, adjoining room and sitting room – was decorated to within an inch of its life. And yet our room was practically spartan in comparison to the central courtyard at the entrance. Although even the courtyard paled next to the glitter of the mirrored restaurant. Honestly, I don’t know what to label the piece de resistance. Was it the the library collection of curios, including Samurai armor? And an ever-present teen, eager to latch onto the free WiFi. This really looks like an awesome place to stay! The jharokha (Look! I learned a new word!) in the rooftop restaurant seems like a great place to eat. Don’t know if I could get used to not having a chair though. And Alex may have just convinced my son that India could be tolerable. Free Wi-Fi! Havelis word first applied in rajasthan and it’s a status symbol of Marwari’s. Havelis design different from other homes which are very helpful in terms of security and comforts.